Rate Your Story is caught up on submissions (unless you've submitted in the last 7 days), so feel free to send us an inquiry if you haven't received a reply with your free critique rating for any manuscript submitted before May 23. Additionally, our submission guidelines have been updated. Please visit our submission guidelines page where all changes have been conveniently highlighted in red. Changes include a preferred file format for attachments, adding the title to the email subject header, and polite requests about multiple manuscripts or revision submissions. If you have any questions, feel free to ask! Thank you for submitting your stories to Rate Your Story. We know based on the dozens of emails and repeat visitors we get every week that our service is very helpful to many writers. Please don't forget that we are still building our summer calendar of guest posts and we are open to your nonfiction queries. We're scheduling into July already, so remember to drop us a note soon if you'd like us to publish something on our upcoming Writer Wednesday series. Our Author Interview Wednesday series generated a lot of interest and provided a lot of tips and inspiration for new writers (and published writers) looking to sell their stories. We'd like to continue that with a new Wednesday series that is primarily furnished by YOU - those who use/have used Rate Your Story's website. 1. In an email's text write a brief cover letter/query. Include a pitch for your article with a brief synopsis of what you'll write about, the specific angle you'll take (if applicable), how long you would need to write it, any sources you plan to use, and a short biography of yourself. Please keep your query to 400 words or less. 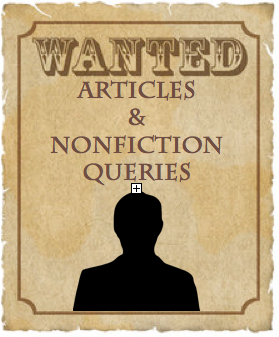 Email your query to rateyourstory@gmail [dot] com and put the words NONFICTION QUERY in the subject heading. We will keep submissions open until June 30, 2012 unless we get overwhelmed with them and/or book each Wednesday's posts through the end of 2012. In that case, it's first come, first served. Authors will keep the copyright on their own articles. We just ask permission for one-time worldwide electronic rights. Please let us know if the article you're querying has been published before (and include the full manuscript in the submission if you have it already written, please). Lastly, we are a volunteer-run site and not a paying market. Authors will be given credit via byline and RYS will promote their post on the day it is published. If you have any more questions, contact Miranda at the email above.